Investigators have identified the cause of Aly Yeoman’s death as drowning. However, they have not yet declared the manner of her death. With no evidence of foul play, suicide nor accident have been ruled out. They further confirmed they found a blood alcohol content of about 0.07% in her system. Nothing else was listed in the toxicology or lab reports. Aly was a beautiful, young Yuba College student who was last seen leaving Mike Lizarraga’s Romero Street home on the evening of March 30, 2017. Later that same night her truck was spotted driving around a locked gate and entering a levee road along the Feather River in Live Oak, California. The next morning, March 31, farmers spotted her truck stuck in the mud at a nearby orchard off Pennington Rd., with a single set of footprints leading away from it. After she was reported missing on April 1, her cell phone pinged on April 2 at 4:33 AM near the Romero St. residence. On April 3 the farmers finally called in the abandoned truck since no one had come to claim it. Detectives searched the entire area and reported the discovery of her truck to the media. Then around dusk that night, Aly’s phone mysteriously appeared near the levee where her truck had been abandoned four days earlier. After many weeks of searching and investigating, on May 6 a fisherman randomly found Aly deceased in the river near where investigators had already searched. Investigators are still waiting on forensic results from Aly’s Toyota Tacoma. And questions remain unanswered on how her cell phone could have pinged in the Romero St. area after her truck was seen stuck in the mud, yet found near her truck four days later. Unless there is any new information gleaned from the truck forensics lab results, or until someone with more information comes forward, the investigation into Aly’s last hours and death will be at a standstill. Little 9 month old Elijah Clyde was handed over to Roseland Community Hospital staff in Chicago, Illinois on June 27, 2017 at 10:00 AM when his parents Sarah Evans and Jerrell Clyde could not be found. Baby Elijah was determined to be healthy and showed no signs of abuse or neglect. The hospital, which is on Chicago’s south side at W. 111th St. and State St., claims to have had past encounters with the woman who dropped off little Elijah, and that she is believed to be mentally ill. She was taken to Jackson Park Hospital for care. Elijah’s local grandparents are eager to bring him home, but children’s welfare services has chosen to place him in foster care until his parents are found. If you have any information to the whereabouts of Elijah’s parents, you should contact the Area South Special Victims Unit at 312-747-8274. Today, the FBI announced in a press release that the black Saturn Astra used to abduct Yingying Zhang from a bus stop on the University of Illinois campus streets in Urbana has been located. The FBI has stated that no further tips are needed about the Astra. They further revealed that several additional leads have developed and the investigation is still active. The rewards for information leading to the whereabouts of Yingying are still being offered. Yingying was last seen on UI security cameras entering the car on the corner of N. Goodwin Ave. and W. Clark St. on June 9, 2017 at 2:04 PM. They asked that information about Yingying’s location should be called in to 1-800-CALLFBI (1-800-225-5324), your local FBI office, or the nearest American Embassy or Consulate in your area. More information about Yingying’s abduction is available here. One June 9, 2017, Yingying Zhang was kidnapped from the streets that weave through the University of Illinois campus in Urbana. She was last seen willfully entering a 2008 black Saturn Astra 4-door hatchback at 2:04 PM for reasons unknown, wearing a charcoal-gray hat with a white logo on the front, a white/pink flannel long-sleeve shirt, a white undershirt, jeans, white shoes and carrying a navy blue backpack. She has shoulder-length, dark brown hair and wears glasses. Crime Stoppers and the FBI have united to offer a $50,000 reward for any information leading to the whereabouts of Yingying. No further details will be released to the public nor her family to protect the integrity of the investigation, to make sure Yingying is found as quickly as possible, and for fear of information being be detected by her kidnapper. The search is now considered a national priority by the FBI. Any information or tips should be sent in via the FBI online form, called in at (800)CALL-FBI [(800)225-5324], or dial 911. Yingying earned her Bachelor’s of Science degree from Sun Yat-Sen University in China in 2013. She earned her Master’s of Science degree in Environmental Engineering from Peking University in Beijing in 2016. She worked as a research assistant at the Institute of Botany at the Chinese Academy of Sciences in China until April 24, 2017, when she came to central Illinois to research photosynthesis and crop productivity under UI’s Department of Natural Resources and Environmental Sciences classes. Yingying has been staying in university housing at the Orchard Downs complex on S. Race St. in Urbana since she arrived. The very excited 26 year old UI agricultural student had made an appointment to sign a lease with an apartment manager at the One North apartment complex in the 1600 block of N. Lincoln Ave. in Urbana, where she could interact with friends and share living expenses. At 1:30 PM the visiting scholar texted the property manager saying she was running late and would not be there until 2:10 PM. She then picked up the 1:35 PM Champaign-Urbana Mass Transit District Teal Line bus at the south shelter near the Orchard Downs complex. She exited the bus at 1:52 PM at the stop on the corner of Springfield and Mathews avenues to switch to another bus line. She walked several blocks down to the 22S Illini bus stop, and waited under a tree on the east side of N. Goodwin Avenue near the corner of W. Clark St.
Surveillance video provided by UI police shows that the black Saturn Astra had circled the area prior to making contact with Yingying. Perhaps it was tracking her after she exited the bus. When it came back around the driver quickly approached Yingying, who had been standing quietly for only a few minutes at the bus stop in front of the UI Electrical and Computer Engineering Building. The white male driver pulled up and immediately captured Yingying’s attention, and they exchanged conversation with for a few minutes. Yingying is then seen entering his car around 2:04 PM, which sped away northbound. The future landlord sent a message to Yingying’s phone at 2:38 PM saying “Hey Yingying! Just checking in to see if you’re on your way.” But she did not reply and has not been heard from again. Her friend (Chuck Guo) contacted The News-Gazette on June 10 to report her missing and seeking publicity in finding her. The Chinese Consulate General in Chicago helped Yingying’s father (Zhang Ronggao), aunt (Liqin Ye), and boyfriend (Hou Xiao Lin) get an emergency visa to come from Nanping in southeastern China to the United States on June 17. Yingying’s mother wasn’t physically up to making the trip, and is emotionally distraught. On June 24, Yingying’s relatives from China attended a candlelight vigil in Chicago, put on by school alumni and members of the Chinese community. Yingying is described as a real family person, with dreams of becoming a professor in the United States or China. Our heartstrings were pulled when Yingying’s father publicly begged to his daughter to hold on and not give up. Neither of Yingying’s parents, nor her 24 year old brother (Xin Yang Zhang) attended college. Her father is a truck driver at an electrical company and her mother is a housewife. Yingying chose UI because she received enough money from a grant to afford to live and study there, and not be a financial burden to her parents. She stayed in touch with family by phone and WeChat. The university is housing Yingying’s family while they are here, and the Chinese Students and Scholars Association on campus is assisting with meals. The family will use any monies raised towards a reward. A news story out of China mentions a June 9 report of a black car driving the campus, the driver pretending to be a plainclothes police officer and asking students if they needed a ride. He had a police badge on his chest, but his name was blocked. After students refused to enter the car, the driver left the scene. The news story also indicated that Yingying’s parents were expediting their visas to come to the US and help with the search for her. On the UI’s Reddit page, a user named “rosabel34” said the driver of a black sedan had approached a friend of hers on June 9, which was reported it to the police. According to the friend, the man had a badge on a chain under his shirt and claimed to be an undercover police officer. He asked her come up to his car for a few questions, but the girl refused. According to carsalesbase.com, The Astra replaced the Saturn Ion in 2008. The total number of Saturn Astras sold in the US: 11,968 sold in 2008; 6,298 sold in 2009; and 25 sold in 2010. The ratio of black ones sold is undetermined. Individuals can research further here. The Astra was available stateside as 2-doors and 4-door hatchbacks, with a 138-horsepower 1.8-liter 4-cylinder engine. Buyers could choose from a 5-speed manual transmission or an optional 4-speed automatic. 4-door models were available in base XE and sporty XR trim levels. Available safety features included ABS, traction control, antiskid system, curtain side airbags, and front side airbags. Among Astra’s standard features were OnStar assistance, stolen vehicle tracking, cruise control, tilt and telescopic steering wheel, heated power mirrors, and rain-sensing wipers. The Astra had conventional steel body panels, not dent-resistant plastic panels. 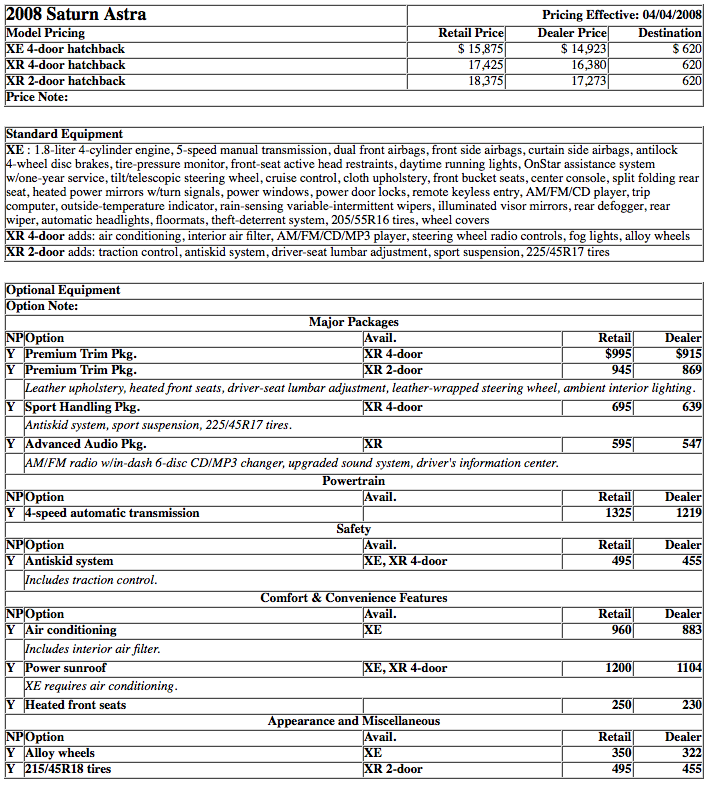 Image of pricing and features available here. Dicsussions about features, sales and reviews available here and here and here. – Crimestoppers and the Zhang family are offering a $40,000 reward to locate Yingying. – The FBI is rewarding up to $10,000 for information to help locate her. – Calls and messages to Crimestoppers route through a third-party call center that strips all identifiers prior to forwarding the information to police. Callers are assigned a unique identifying number to remain anonymous. Aramazd Andressian Sr. was arrested and booked on Friday, June 23, 2017 at 1:00 PM for suspicion of the cold blooded murder of his 5 year old son, Piqui. The 5’3″ 35 year old man is being held in a Las Vegas jail on $10 million bail until he is extradited to Los Angeles County. The sheriff’s department has not disclosed whether or not Piqui has been found, nor have they disclosed what bit of information led to the arrest. In coordination with LA County Sheriff’s Major Crimes Bureau Fugitive Taskforce, LV Metropolitan PD, CAPE (Major Violator/Narcotics Crimes Bureau), Homicide Section and the Pacific Southwest Regional Fugitive Taskforce of the US Marshals Service, LA County Sheriff’s Department Homicide investigators presented evidence to the LA County DA’s Office that allowed them to obtain a murder filing against Andressian Sr., who has had nonstop eyes on him since he began living in Las Vegas after Piqui’s disappearance. The discovery that Andressian Sr. had been living in Las Vegas came as a surprise, as it has been kept under wraps as a crucial part of the investigation while detectives gathered evidence against him. The shortly statured man was handcuffed and taken into custody sporting a hairless face and orange tinted blonde hair. Detectives have been searching for Piqui since April 22, when Andressian Sr. failed to return the boy to his mother. Andressian Sr. was found deliberately unresponsive in Arroyo Seco Park next to his gasoline doused car, and had ingested stolen prescription pills. At that time he was arrested on suspicion of child endangerment, but he was later released due to lack of evidence. Andressian Sr.’s earlier desperate plea for the public to help in the safe return of his son, his namesake, fell flat and empty when it was released. No one believed Piqui would be returned alive then, a belief cemented when Andressian Sr. was noticeably absent from any searching going forward. Andressian Sr.’s mother and sister, who had accompanied Piqui on his last Disneyland trip on April 20, also seemed unconcerned and unaffected by Piqui’s absence, leaving the public wondering if they’ve known all along that Andressian Sr. murdered his son. It also leaves lingering questions about their possible involvement, or if they had any involvement in the cover up. Our hearts go out to Piqui’s mother, Ana Estevez. She made a heartwarming public statement to her son on May 18, one that brought empathetic grief to all who viewed it. With tears in her eyes she said “To my son, this message is for you my love: be brave, honey. I am counting the days until I see you honey and I will never stop looking for you.” Refusing to give up on his safe return, on June 5 she again reached out to the public in her search for little Piqui. Her heartbroken words devastated viewers when she said “I look at his picture all the time. I have a picture in my room. I talk to him; I pray that I will see him in my dreams. I sleep with his little sweater; I hug it every night, imagining that it’s him. I just want him to know ‘don’t give up hope, mama’s looking for him’.” Here are FMP, we offer our sincerest condolences to Piqui’s mommy, and all those who love and lost little Piqui. A press conference to be held on June 26 at 11:00 AM PST at the Hall of Justice in Los Angeles, CA will hopefully provide more details about Piqui’s whereabouts and the arrest of Andressian Sr.
Last seen on April 20, 2017 leaving Disneyland with his father, paternal grandmother and a third adult, little 5 year old Aramazd Andressian Jr., aka Piqui, has now been missing for over 7 weeks. It was learned that Andressian Sr. was spotted in Orange County on the morning of April 21, then later that day at Lake Cachuma. Piqui was not seen with him. In the early morning hours of April 22, Andressian Sr. was located in Arroyo Park lying next to his gasoline doused BMV in a state of faked unconsciousness. Piqui was no where to be found. Andressian Sr. has been named a person of interest, since he was one of the last people seen with Piqui and claimed Piqui was with him at Arroyo Park on April 22. He has also provided authorities with “inconsistent” and “misleading” statements. Last month Arroyo Park was searched more thoroughly (based on a “credible tip”), and Andressian Sr.’s mother’s Montebello home was searched for evidence. Authorities have declined to reveal what they uncovered, but did disclose that searches were related to leads they had developed. After working through the evidence they have now gathered, Los Angeles law enforcement officials determined that Piqui’s father had driven the roads between Solvang to Nojoqui Falls and along Highway 154 south of Lake Cachuma in what appears to be a loop some time after they all left Disneyland but before Andressian Sr.’s next credible sighting at Lake Cachuma on April 21. As a result, this week 150 search-and-rescue personnel began a new, intense search for Piqui in those areas of the Santa Ynez Valley. The first leg of this search is focusing on roadside stops to determine if he hid Piqui somewhere out there, handed him off to someone, or if he discarded anything off of the sides of the roadways. The search efforts include scent dogs, deputies on horseback, drones, and a helicopter. If Andressian Sr. had originally meant to take the cowardice way out and intentionally end his own life after the disappearance of Piqui, he may try it again. We hope authorities are also keeping a close eye on him while they slowly close in on him. Updated June 9, 2017 at 11:50 p.m. Sad sad news today. It is with heavy heart that we report Aleksandra “Ola” Reeves was located deceased in Baltimore, Maryland. On June 6 she was found in a wooded area near an area where homeless camp along the embankment above the Jones Falls Expressway, near Guilford Avenue and E. Preston Street. Her car was just a short distance away. Her cause of death has not yet been determined. What could have happened at her job, what did she discover, or what did she see, that caused her to abruptly flee? Did she take her own life or did someone harm her? Could her death be related to missing person Anna Gould? We hope someone is investigating. FMP would like to express our sincere condolences. Anna Bronislawa Maciejewska-Gould went missing on April 10, 2017. Now only a few weeks later a second Polish woman, Aleksandra A. “Ola” Reeves, has also gone missing from Pennsylvania. Could these two missing women cases be related? There are some similarities. A third blonde Polish woman working in finance had gone missing for over 24 hours last week. 21 year old Angelika Rosada of Elmhurst, IL had not returned home from work on June 1, but left her family a confused and disoriented phone message that night. She has now been found safe. According to her husband of ten years, the morning 43 year old Anna left her home, she was in a panic and claimed she would be late to the finance company where she’s worked as an Actuary for the past 17 years. She presumably had been acting peculiar in the days before she disappeared. She had been planning to travel to Poland, but her passport is still at home. Anna left her cell phone at home and her car was located just a few miles from her residence, but she is still missing. Did her husband do something to harm her, or is there something bigger going on? On May 23, 2017 Ola abruptly left the finance company where she has worked as an analyst for the past 10 years. She told them she couldn’t focus on her job and would not be back for awhile. It is unclear if Ola permanently resigned or just said she needed time off. She presumably had been mentioning job stress issues to her family in the weeks before she disappeared. She went home briefly, then stopped to gas up her car. About an hour later a panicked Ola contacted family then turned off her phone. That’s the last time anyone has heard from her. Did she harm herself, or is there something bigger going on? About 15 years ago Ola came to the US on a work visa where she worked in the security department at Hersheypark. This is where she met her now husband of 13 years, Michael Reeves. Ola is known to be very sociable and outgoing, with a love for the mountains and gardening. 37 year old Ola has now been working as a business analyst for the Pennsylvania Employees Benefit Trust Fund (PEBTF) for over ten years. According to this Polish article, PEBTF manages health insurance and government benefits for Pennsylvania state employees and their families. After she left work that day, she went to her Middletown, PA home around 12:15 pm. Exhibiting panic, Ola expressed her need to get away, perhaps back to her native Poland. However, she did not take her passport and left behind most of her personal belongings. Apparently she had access to a large amount of cash in her home, but she also left most of it behind. Around 2:30 pm she was seen gassing up her car at the Turkey Hill store in Elizabethtown, PA. She then left heading east on highway 230. About an hour later at 3:30 pm, she contacted relatives sounding panicked and stated that she might never see them again. On May 25, her red two-door Fiat 500 Abarth with a black Pennsylvania D.A.R.E. license plate DA 29K8 was spotted heading North on Highway 219 in Elk County, PA, possibly towards New York. Perhaps she is headed to Niagara Falls. Mike has reached out to Ola’s family and the Polish community in hopes that someone has information on her whereabouts. Both of these women immigrated from Poland within the last 15 years, live in southeast Pennsylvania (Malvern & Middletown), have been married a little over a decade, have blonde hair and blue eyes, have recently suddenly been acting panicky and stressed about work related issues, both work for finance companies, and neither can be traced by cell phone. Anna is 5’4” tall, 150 lbs. Ola is 5’5″ tall, 115 lbs., and has a heavy Polish accent. She has a tattoo of a spider on her right shoulder, and was seen wearing jeans and a t-shirt. Anyone with information on either of these two women should call Pennsylvania State Police at 717-671-7500. Anna Bronislawa Maciejewska-Gould, 43, was last seen leaving her home for work on April 10. She is 5’4” tall, weighs about 150 lbs., has blue eyes and brown hair with blonde highlights. She was driving her dark blue 2011 Audi A4 with the license plate HTF2919. If you saw Anna or her car please contact Pennsylvania State Police at 610-486-6280. Anna graduated from Warsaw University in Poland in Mathematics and Computer Science. She immigrated to the US about 20 years ago and became a U.S. citizen. She studied Actuary Mathematics in Louisville, Kentucky and is a member of the American Academy of Actuaries and a fellow of Actuaries. She’s been employed as an Actuary and Quant at Voya Financial Inc. (previously ING) in the East Goshen section of West Chester for the past 17 years. She is described as very intelligent, highly valued, and likable by her coworkers and friends. She lives with her husband of ten years, 52 year old Allen Jay Gould, and their four year old son Andrew (his birthdays are in May) in a beautiful and much loved home she personally designed in 2015 on 10 Hedgerow Ln. in Malvern, PA in Charlestown Township. She lived in Exton, PA and at 675 Metro Ct. in West Chester previously. Anna is reported to have last attended work on March 26. On March 27 she called her mother Janina Maciejewska in Warsaw, Poland to say she was planning to travel there with her son to attend her father’s 80th birthday celebration on March 30. The next day, March 28, she texted her mom in Poland saying “Mommy, something came up at work and we will arrive on Thursday, but we will stay the weekend (returning on Monday). Kisses, Anna”. That evening Anna called Poland again and verbally repeated the same itinerary to her family. During that call it was suggested they postpone the birthday celebration until Easter. Anna stated she would discuss the idea with Allen that evening. That was the last time anyone other than her husband has heard her voice or made contact with her. Since that last call on March 28, other than Allen none of Anna’s family members, coworkers or friends have seen or spoken to her. After no contact with Anna for the entire next day of March 29, Janina sent a text message to her daughter asking if she was still planning to come to Poland the next day. Anna abruptly cancelled the trip to her native Poland by simply replying “I’m sorry I cannot come, kisses Anna”. Anna’s elderly father was disappointed that Anna did not call, but only texted him on his birthday. “It’s really not like her” said Janina. It has been reported that Anna was seen at a restaurant having dinner with her husband and son on April 2 or March 26 (the friend can’t recall which date for certain). Anna then allegedly became ill so notified her work via text message that she would also not be in for the week of April 3. Janina contacted Allen on April 8, who instructed her to call back in two days. After those two days, on April 10 Anna’s family from Poland reported her missing to the police in Philadelphia, PA. After Anna failed to show up for work on April 10-11, her employer notified Pennsylvania State Police about her disappearance. An investigation began on April 11 after the employer showed concern that Anna had requested the past two weeks off of work, then failed return on her first day back on April 10. She never completed her 10 minute drive to work that day nor did she return home that evening. Anna did not take her cell phone or passport with her, but may have had her wallet. State police continue to attempt to work with Gould through his attorney, Evan Kelly of West Chester. Kelly released a statement on Allen’s behalf saying it’s a very difficult time and requested privacy. On May 8, Anna’s Audi was located at Charlestown Meadows overflow parking lot on Ashtree Drive in Malvern, near neighborhood walking trails. Some of Anna’s personal items were found in her car, which was impounded for investigation. The contents have been kept confidential. On May 13, forty investigators including Embreeville Station Troopers, search dogs, and State Police Academy Cadets returned to conduct an extensive search around the Charlestown Meadows development, the surrounding neighborhoods, and the wooded area around the walking trails. It is unknown if Anna had previously visited the trails. If you have seen Anna or her car since March 28, please contact Pennsylvania State Police Embreeville Barracks in West Bradford at 610-486-6280, 1-800-4PA-TIPS, or 911. The case is assigned to Lt. Brandon Daniels, Criminal Investigation Section Commander. It appears Lois Fink is no longer considered missing. The Aware Foundation Facebook page posted the following about Lois’ status on May 24, 2017: “According to the Princeton WV PD Lois Fink’s case is now closed and we can remove her flyer.” At the time of this posting, there is no verification by Princeton police that she is found, so we’ll just have to take The Aware Foundation’s word for it. Before her case was closed, some pretty harmful slander had affected her husband and son in very negative ways. For as long as this link remains active and the comments aren’t deleted, you can read here and/or below how hurtful the accusations and misconduct from locals in Princeton, WV have been to Lois’ family, which no doubt would only further her distress. There is no proof that Lois’ husband Rick or their son ever harmed Lois, so it’s really slanderous, hateful and just mean. Previously, we read that Rick had claimed Lois was suicidal because of how her birth family had been treating her. We also read she had been having an affair, possibly online, with a man from Oklahoma in the Fall of 2016. Obviously, if a person is having an affair their marriage is rocky. And, she has a teen son at home, which is stressful for any parent, any where. And if you read the links or viewed the images below, it seems locals are not very nice to her, even hateful and bully-ish. So most likely it’s a combination of all those multiple things that finally overwhelmed her and affected her mental state so greatly. We here at FMP don’t know the actual circumstances surrounding her condition, but it’s not too hard to conclude that she’s in a hospital getting mental help and healing. Due to HIPPA laws and even just general respect of her privacy, we cannot verify that. But we do wish her the very best and hope she can soon get back to a normal life that has her once again smiling in pictures.